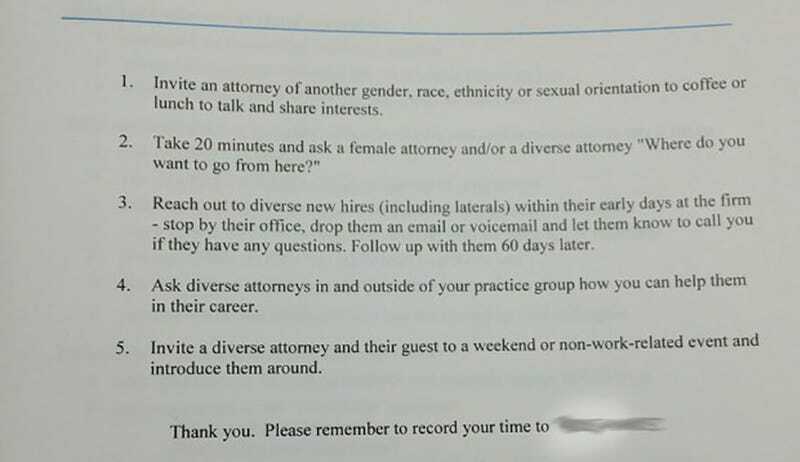 Is This the Most Offensively Misguided Diversity Memo You've Ever Seen? I recognize that whoever wrote this memo is attempting to make it easier for minority (or whoever this company qualifies as "diverse") employees to engage in office interactions and get the same kind of casual mentoring that the employees who are not minorities may receive, but how can the equality and integration that's being pushed here happen when the memo doesn't read "ask a coworker who's new or who you don't usually talk to where they plan to go from here" but immediately brings in gender, race, and sexual orientation. I know that just writing "invite a coworker to an out-of-work event" may encourage employees to invite out others who share their cultural backgrounds, but there's got to be a better way to send the message that diversity is important without othering the employees who the company would identify as such.